I've written about Skyzoo here before, as I reviewed his debut solo album, The Salvation (released in 2009), a few months ago. I have always been a big fan of the Justus Leaguer, as he possesses outstanding lyrical ability, great storytelling skills, and has access to some of the best producers in the business. For Cloud 9: The 3 Day High, his debut record period (not solo), Skyzoo teamed up with 9th Wonder. Cloud 9: The 3 Day High is a 12-track collaboration effort that was completed in three days, hence the "3 Day High" part of the album's title. The project was recorded somewhat early on in 9th Wonder's career, as he was yet to really break out as a beatmaker in 2006. However, that does not mean that the record sounds at all amateurish, as it contains arguably some of 9th's best production work. Obviously, Cloud 9: The 3 Day High was released very early in Skyzoo's career, as well, but you would never know it from listening to the Brooklyn area rapper on the album. Although his pure rapping ability may not have been at the same level it was on The Salvation, it was still pretty damn impressive, as Skyzoo immediately gained a cult following after he and 9th dropped this effort. Okay; so this is essentially an album intro disguised as an actual song, but nevertheless, it's three minutes long and Skyzoo actually does rap over it (even if it is only to talk about what to expect on the album), not to mention that 9th Wonder's instrumental is pretty dope. This was certainly a very, very fresh way to open things up, as one can instantly hear the talent that 'Zoo is blessed with on this cut. I dig it. This track bangs, as 9th Wonder uses the same sample that was used on Killah Priest's song, "Black August (Daylight)," off of Black August. The production is ridiculously soulful, and Skyzoo rides it fluidly, matching the uptempo nature of the beat and spitting a pretty solid and in-depth hook, as well. Oh, and his "never learned swag, I inherit the recipe" line is just plain sick. "Way To Go" is definitely one of my favorite records on Cloud 9: The 3 Day High. And 9th does it again. The instrumental on this track is ill, containing a booming bassline and an unsurprisingly soulful sample that cuts deep for the listener. You should also realize by this point that Skyzoo has a propensity for creating great hooks that aren't merely made up of a few words. Great record. This is a typical track about a rapper trying to get himself out of the gutter, and Skyzoo adopts the topic extremely well and really makes you stop and think in the process. 9th Wonder's beat is solid and suits the mood, and S.K. closes out the track by reciting "I solemnly swear, what I perform in the booth, all of it is truth" three times. Skyzoo crafts a song for the ladies here, and unlike most rappers, he's able to do it classy, rapping how he wants to make sure he finds the right girl and promising that one that no matter what happens, he'll return. 9th's instrumental is incredible, consisting of banging drums, a vocal sample, and simply beautiful guitar strums. Definitely one of the album's strongest cuts. "I'm On It" is one of the most uptempo tracks on Cloud 9: The 3 Day High, and it works wonderfully. 9th Wonder's production is ill, and Skyzoo sounds fantastic over it. Also, even if 'Zoo abandons his "complicated hook" theme on this one, the hook is still very catchy. Skyzoo describes the life of a hustler on this song, which I'm sure you expected given the track's title. 9th's beat is solid, although it does seem like it isn't pronounced enough. All in all, "The Bodega" isn't exactly one of my favorite records off of the project, but that doesn't mean it's bad, because it isn't. I just think there are much, much stronger cuts on here. Although this seems like another love rap by Skyzoo, I have a feeling he was actually using a woman as a euphemism for hip-hop, given the commonality that type of metaphor has gained in the rap game (thanks to Common's "I Used To Love H.E.R."). Then again, if he were, would he really say, "even outside the sheets, we was kinda complete"? Maybe not, so maybe my feelings were wrong. Anyway, this track is decent, although, like "The Bodega," it isn't one of my favorites on the album, as I felt like 9th Wonder's production was a bit lazy. Ahh, back on track. Similar to "I'm On It," "Live & Direct" possesses a very upbeat vibe, but even moreso than the aforementioned song. This is the best song on Cloud 9: The 3 Day High, as 9th's instrumental, relying on fast-paced drums and some blaring horns, is phenomenal, and Skyzoo absolutely tears it to pieces. If this cut doesn't put you in a good mood, then it might be time to start consulting a doctor about some anti-depressants (no offense to anyone; just saying). Man; 9th Wonder certainly made up for that short snooze he took on tracks seven and eight in a big way on "The Spirit" and its preceding track, as the beat on this knocks. Skyzoo rips it, too (his delivery is just tremendous), and he lays down yet another spectacular hook. Sick, sick record. Keep those bangers coming, 9th. "Extreme Measures" is just another example of how sick 9th Wonder can be when he is at the top of his game, as the instrumental is outstanding. Skyzoo rises to the occasion, as well. There is no hook on this cut; just S.K. spitting his as off about the struggles of life for nearly four minutes. I love it. You may have noticed that Skyzoo hasn't really engaged in much braggadocio rap on Cloud 9: The 3 Day High. Well, that's about to change, as he does nothing but boast on "Mirror Mirror." That said, this track is actually somewhat boring, as 9th's beat crawls (not in a good way), and it seems like 'Zoo's voice overpowers the production. It probably would have been a good idea for Skyzoo and 9th Wonder to use one of the uptempo beats for this record, but oh well. There aren't many rappers out there who can tell a story like Skyzoo, and he demonstrates that on Cloud 9: The 3 Day High. And to think this was S.K. 's first LP. Even if the beat was somewhat underwhelming (and that didn't happen often, mind you), he was still able to kill it on the mic and essentially carry the track, a quality that not many artists possess. For the most part, 9th Wonder's production on this album is pretty damn great. As expected when dealing with 9th beats, every instrumental retains some kind of soulful feel, and the drums that he uses on some of the tracks are nothing short of incredible. His style also fits Skyzoo like a glove, allowing 'Zoo to flow effortlessly over each and every song. 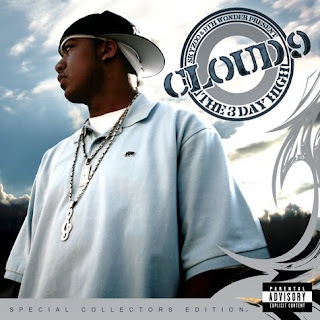 While I feel that The Salvation certainly flashes Skyzoo at his lyrical best, Cloud 9: The 3 Day High is actually my favorite project by him. I really dig how the direction of the album changes multiple times throughout, both in terms of S.K. 's subject matter and 9th's production. Cloud 9: The 3 Day High is one of those records you can listen to whenever and wherever. It is simply an extraordinarily impressive freshman effort by Skyzoo on all fronts, and it also marked a period in 9th Wonder's career where he was just about to hit it big. This was just a great collaboration. Let's hope they have another one in the works.